Check out the range of fantastic deals that we have negotiated with our technology product suppliers. They are available to all of our public sector customers, so start saving today. We’ve been working with a number of suppliers on our Technology Products agreement (RM1054) to offer you huge savings on a range of products including desktops and laptops. These short-term deals with manufacturers, including Hewlett Packard, Dell and Lenovo, could help you save up to 35% for your organisation - whether you are a school, college, local council, NHS trust, charity, police force or government department. These Flash Sale deals are only available through Technology Products (RM1054) via the catalogue content on the eMarketplace. 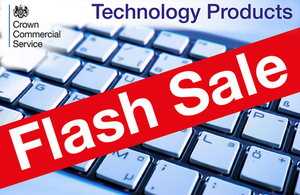 25 April 2016 The Technology Products Flash Sale is now closed.